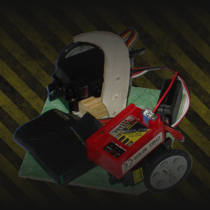 Welcome to Team Bobblebot We are a team who build fighting robots, similar to those seen on the TV series Robot Wars. Antweights: 150g Fighting Robots Find out all about Antweights and get help and advice on how to build your own. Robot Wars Archives Find out all there is to know about the hit television series Robot Wars in our comprehensive archives on the show. The Antweight Wiki is a mini version of Wikipedia just for Antweights. Anybody is welcome to contribute by writing or editing a page. Robot Wars may have finished, but Live Events are held all year round by organisations such as Roaming Robots, Robots Live and RoboChallenge. Information was correct at time of publishing, we do our best to ensure it remains up to date. Are you running a live event? Tell Us.